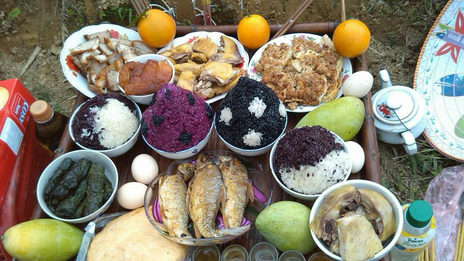 The Thanh Minh (grave-visiting) festival, which falls on the third day of the third lunar month, is one of the most important festivals of the Tay and Nung ethnic groups as it is a celebration to remember the credits of parents, ancestors and the dead. In the Tay and Nung people’s belief, Thanh Minh festival is a time for family reunion, no matter where they are living or working far from hometown, they always return home ahead of the festival to join their other family members on the occasion. One day ahead of the festival, each family prepares a tray of offerings, the more number of households the family has, the more abundant their offerings will be. 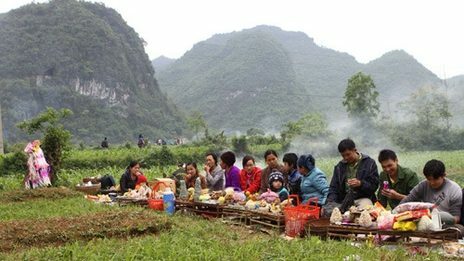 In the northern province of Cao Bang, from early in the morning of the opening day, people flock to the hillsides and mountain sides, where the graveyard and cemeteries are located, carrying their offerings, such as boiled chicken, pork, fruits, votive papers, eggs, wine, and coloured sticky rice, including the two indispensable colours of black and red. The colours of the sticky rice are made from leaves grown in the locales’ gardens. Not only producing natural and eye-catching colours, the leaves also bring a distinctive aroma to the dish. As a celebration to pay tribute to the dead, the villagers also clean up and burn incense for unmarked graves during the festival. After the visiting ritual, the family members gather together to enjoy the offerings and hold exchanges with other families. The festival is also observed among Tay and Nung ethnic communities in Binh Phuoc, Binh Duong, and other South-eastern provinces, during which worshippers prepare ‘may nhuong’ (steamed bamboo shoots filled with minced pork) as an essential offering for their ancestors.